Since David (Meldonmech) in his QCTP build thread and Andrew mentioned alloying copper with aluminum to increaase hardness, I did a few lookups online (and in a book I have) and found an alloy that looked interesting using 6% silicon and 4% copper, so decided to try it with scrap onhand. I wasn't sure if the aluminum would dissolve the copper directly, or whether the copper should be molten first, so I tried melting the copper to start with. After about 25 minutes and the copper glowing bright orange, it still wasn't molten, and being impatient, I started dropping some of the aluminum in. When a good heel was going I added more and eventually the piston, and had a brimfull crucible as a result. The copper did dissolve in the aluminum, so I probaby could have saved much time and fuel had I just put them all together to begin with. I'm new to this forum and this will be my first post. Re the comment you make about aluminium and copper reminded me of a demonstration of eutectic alloying that our metalwork master showed the class back in the 60s. He heated a strip of copper to a dull red then applied a thin piece of aluminium wire to the surface.It melted onto it and he then proceed to poke a hole through the strip thereby demonstrating how alloying changes the melting point. I've enjoyed catching up on a lot of the posts since Doubleboost recommended the site and am learning a great deal. I'm keen to make a small furnace myself as the last casting that I did was 50 years ago! Interesting Steve how dose your new alloy machine ? I found out about the copper by mistake droped a piece of copper pipe in the furness , by the time I bent a pice of wire the fish it out half it had melted , so I added all my offcutts the resulting poure turned very nicely on the lathe into pullys . I just poured ingots -- long ones so I wouldn't mix it up with my other stock in muffins. Hi Seadog, welcome aboard! Yes it sure did dissolve easily after all. Rob, I haven't tried machining it yet, but will. 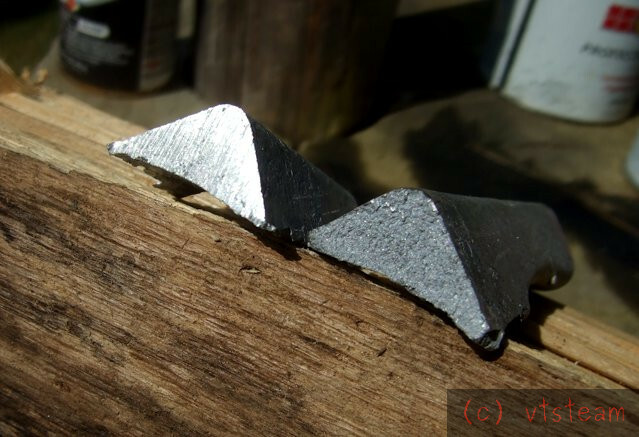 I did snap one of the thinner ingots in half in the vise with a big hammer. It definitely breaks rather than bends. It feels hard, and rings hard. But it isn't any harder than a piece of 6061 I tried scratching it on. Also, no harder than a cast aluminum part on my Gingery lathe (pure melted pistons). Not s hard as zamak za-2. But it did scratch some of my newer stock of ingots (also pistons). Not much harder than them, though. I'm guessing the difference may be due to aging of the castings and 6061, possibly making them harder, while the newer ingots were scratched. Anyway, not a big improvement in hardness. Nevertheless just handling it, it seems hard and tough -- just a subjective impression. I don't know why that is. It saws readily with a hacksaw. No tendency to smooth over or gum up. It files easily, and again seems harder under the file subjectively. 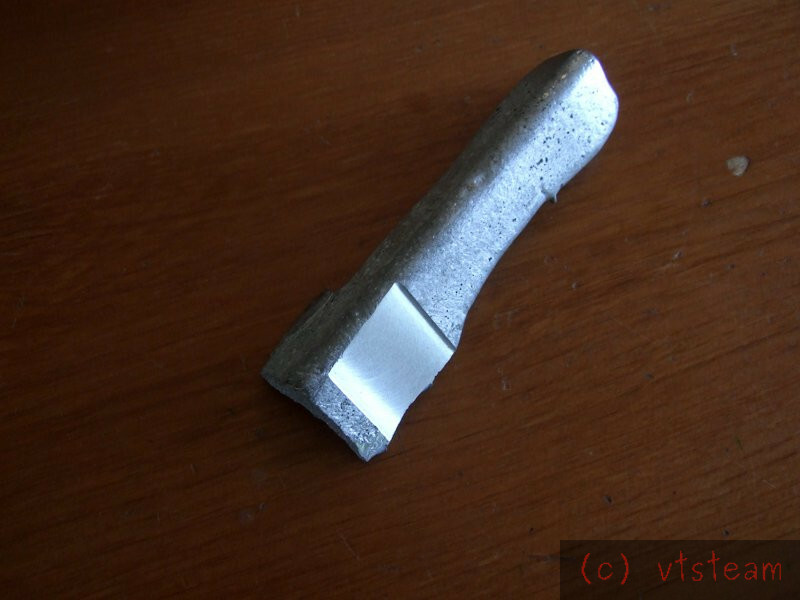 Unfortunately I can't compare it to my other cast aluminum for strength and brittleness, since I don't have a similar section in those others for the vise break test. I did try some 6061 of similar thickness which seemed much tougher. But it's a good tempered extrusion alloy compared to cast, so that wasn't unexpected. The big question is, is this a better casting mix than just straight pistons? I guess unless tempered, the properties are not a whole lot different than other sand casting alloys, from the looks of it. Intresting Andrew -- how much copper was in the alloy? I just machined this mix (un-treated) and it machines well enough as is. No idea if it were hardened. The finish is not as shiny as plain 6061, but maybe a little shinier than the high silicon piston material that I use. I had intended to make a form of Duralumin, which age hardens, but after the event I realised that my aluminium source, like yours, being pistons had silicon in them. Copper was about 4%, silicon unknown - I supposed now that I have my alloy tester I could sample it if time permits. The particular alloy I was imitating is not iisted for solution treatment and aging to temper, but what the heck -- I heated a sample up with the torch, short of melting and plunged it. Now scratches 6061 t6 lightly. Will check it tomorrow to see if there is a change, how it machines, etc. 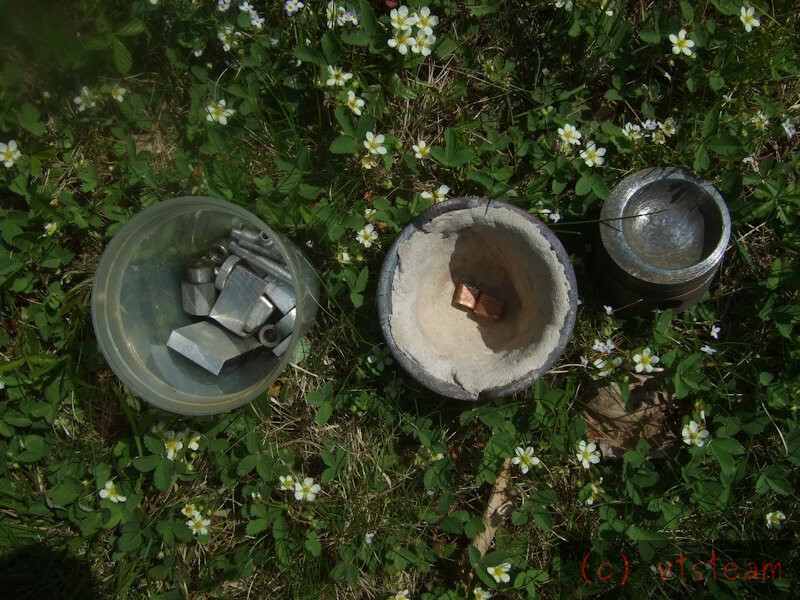 In the past I have added copper to the soft pure aluminium at about 4% which seemed to reduce shrinkage and produce harder ingots. I don't recall making anything with them but probably just chucked them in with other stuff cos in the early days I didn't separate my ally out into type. Hi John, thanks for the info. I jumped the gun a little tonight and tried a scratch test of the heat treated piece again, and it has clearly increased in hardness in a little over 4 hours. It now clearly scratches 6061-t6 and all the aluminum samples both cast and extrusion that I've tried. It scratches the un-treated aluminum copper alloy ingots as well. The untreated ingots in turn will not scratch the 6061-t6 sample, so they have not increased in hardness by aging. My conclusion is, the mix of piston material (with likely about 12% silicon) plus low silicon scrap extrusions (probably entirely 6061) to yield a probable 6% silicon content, plus the addition of 4% copper from clean anealed tubing yields an alloy which has similar hardness to 6061-t6 aluminum alloy. Heat treatment with plunge can be used to increase the hardness of this alloy further, and aging also increases its hardness. I'll try machining it tomorrow. My lovely but shy assistant (she's trained in horticulture, you know!) saw the photo in your first post - she thinks the flowers are potentillas. Are they? I'll ask Chippie, the resident chipmunk and wild strawberry expert what he thinks, Rob! I milled, filed and hacksawed the hardened piece of Al/Cu today with no obvious problems, though the mill was a carbide insert type. But the fact that a hacksaw worked fine means it will probably mill okay with steel based mills as well. It is not as hard as zamak, nor mild steel or cast iron. Subjectively, it feels "harder" than most aluminum I cast or use from extrusion scrap. Seems that way filing. Sawing actually seems easier than gummy aluminum -- feels more "crunchy". The cutting action feels cleaner, and maybe even faster. Milling throws small crumbs of swarf, not curls. I didn't see evidence of the aluminum tendency to weld to the tool without coolant. But it was a very small sample. I don't know what to think of this stuff. Whether it's an advantage or not to alloy copper in my aluminum casting. Mainly because I don't have any comparison of strength to what I've normally cast in the past, and in comparison with named extrusions. If I knew it had a definite strength advantage in casting, I'd probably use it a lot. It is clearly harder than my past castings if heat treated, but that's not necessarily a desirable quality for most of what I make from aluminum. I don't use aluminum for high wear parts, and aluminum doesn't have as good bearing qualities generally as some other metals I have on hand. Maybe it would be useful for tool holders and machine fixtures. I know in over 200 years of scientific metalurgey a lot of alloys have been perfected but the numbers surely say there may be a magic alloy out there still to be discovered! Will, I can predict with absolute certainty, with regard to new super alloys developable but not yet tried, out of 7,880,400 possibilities, that I won't be the one doing the experiments that produce them! Just thought I'd try adding copper to the melt and adjusting silicon to approximate a known alloy proportion with apparently good sand casting qualities. I tried to dissolve copper in molten aluminium it but did not work. I used very thick clean copper wire. 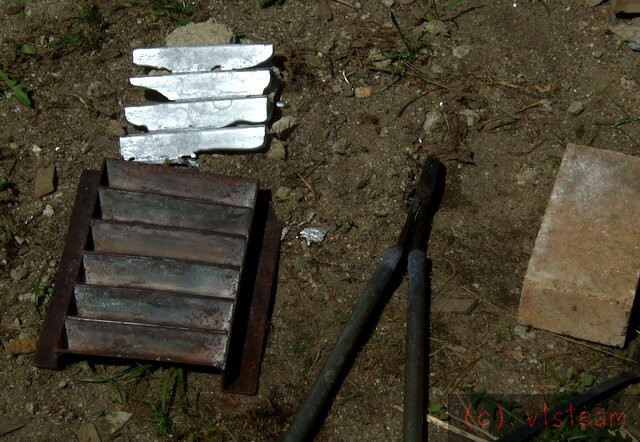 Your method of preheating copper before adding to the molten aluminium could be why my experiment did not work. Hi ironman great to see you back! Well since that happened to you, I guess I should try that, too -- putting copper and aluminum together from the start. I should also really try to cast this alu/cu mix and non-cu piston/6061 mix metal into the same thin sections and break them to see if there seems any difference in strength. Well I guess I'll need both hardened and non hardened alu/cu as well to really tell. Then I'd know whether it was worth adding copper or not.